Jodi: We started out bright and early, 5am to be exact to travel to the east coast. Our first stop was a favorite, Canaveral National Seashore accessible from A-1-A just south of New Smyrna Beach. David: I know, we’ve been here before, but sometimes you return to an old favorite and try to see what you might have missed on previous trips. Besides, what a great place to catch the sunrise and the early risers! Jodi: A flock of pelicans was on patrol as soon as the sun came up. I truly enjoy how they majestically glide across the sky in search of their next meal then dive into the ocean with a splash worthy of a 9.9 in a competition. Jodi: We were about to take a walk when we noticed this storm moving into the area. Not ones to melt, we took a short walk just to see who else we might encounter. Jodi: Apparently these little guys (gals?) didn’t like the windy, rainy day any more than we did. Check out how they are standing on one leg with their beaks buried in their feathers. It started to rain harder and we still had a lot of time left on our schedules, so we decided to just take a drive south to see what was happening at the south section of the Canaveral National Seashore and Merritt Island National Wildlife Refuge. Jodi: At Haulover Canal, we found a few manatees, and a couple dolphins. David: The manatee observation area on the canal has been worth a stop on most visits to the Refuge. Patience is usually rewarded with a marine mammal sighting! I asked Jodi if she was interested in exploring a “new” road I had found. She was game and we were off to the Bio Lab boat ramp a short distance away. David: A sign off the main road directs you to the Bio Lab boat ramp. Before reaching the actual ramp area, Bio Lab Road intersects with the access road and travels for about six miles south through salt and freshwater marshes and along stretches of open water. The narrowness of this road makes for some interesting cooperative moves when you encounter a vehicle coming from the opposite direction! David: We had traveled a relatively short distance down the road when we noticed a flock of birds…a big flock! Jodi: The weather cleared up considerably down in this area, so we found several alligators out sunning themselves, and looking for tasty photographers. This guy was only about 10 feet away. Jodi: David, what do we have here? Butterfly nooky? Jodi: For the record, I never drive on these trips. I drove once I think… David said everything was a blur. I think that’s his way of saying I drive too fast. Guilty as charged! I do drive too fast. So, early on we established that he would drive. It’s a good deal for me, I get to sit back and ride and look around. He gets to just go where the mood strikes him. It works for us. David: It wasn’t that bad. Well, OK, yes, it was that bad. Even though I’ve professed to not being a “birder”, I’m a sucker for scrub jays. We had left Bio Lab Road behind and I suggested a visit to the Visitor’s Center. We were traveling on the main road through the coastal scrub area designated as scrub jay habitat. I saw a jay in the vegetation along side of the road and, well, you know the rest of the story. Jodi: This patient, brave, little bird is David’s favorite. So we are on the hunt every time we’re out. David: What’s not to like? Endemic, social, keystone species…an admirable member of our fauna. Jodi: After my brush with death over a blue bird (Scrub Jay) we did a short walk on this beautiful raised walkway at the Visitor’s Center and gift shop. I was thankful to be on solid ground again. David: An easy and “clean” walk through some hydric or wet habitats. There is a floating platform on one of the ponds here that provides a sunning opportunity for the turtle population. Throw in the butterfly habitat and there’s a lot going on along this short walk. Until next time, get out there and Hike Central Florida and Beyond! David: We scheduled our biking day for a Sunday. We wanted to get on the road fairly early in the morning so, Jodi’s husband, Jeff, and I loaded the bikes in my vehicle Saturday night. As I suspected, there were three bicycles and no lounge chair as was called for in the original, i.e. Jodi’s plan. This trip was going to be interesting! Jodi: The plans were made and the day had come to bike and tan at Canaveral National Seashore (CNS). The guys were going off on their bicycles and I was going to soak up some rays. I wanted to finish up that John Grisham novel I’d started. Yeah! Dave’s SUV was loaded and ready to go. I called ‘shotgun’ and climbed in the front passenger seat. I looked back to see Hubby and three bicycles. Three? Is my chair back there? Nope! I gave him that wife to husband ‘you’ve got to be kidding me? !’ look. He just laughed and said you’re going with us. Great I thought. The last time I was on a bicycle, I was nearly hit by a car. It was completely my fault. I’m not exactly known for my gracefulness. But that’s what this blog is about…getting up and out and doing new things. Ok, I’m a good sport, I’ll roll with it. (Pun definitely intended.) As it turned out, Hubby who is a Florida native didn’t know there were North and South Districts of CNS either. Note from David: Jodi and I were so fascinated by the features of the Canaveral National Seashore that we made three visits to try to experience all that it had to offer. From eyebrow-raising moments to local history to natural beauty, this place had it all. 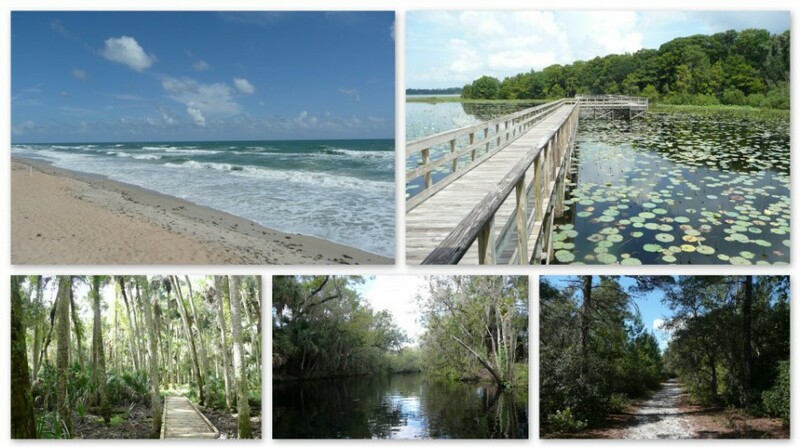 We will have a total of three separate posts about Canaveral National Seashore, each one coinciding with a visit. David: It’s great sometimes what we re-discover by accident. I guess I was feeling a little restless one day and just needed to get out…maybe do some exploring. I decided to do some much-needed shopping along with my exploring. The required items were soon secured and I headed toward New Smyrna Beach on SR 44. My plan wasn’t so much to go to the beach, but to, I guess, fill in some gaps in my knowledge of the coast line from New Smyrna Beach and south. Continuing on SR 44 across the causeway, I made the big right “bend” onto A1A or S. Atlantic Avenue and headed south. I had a vague idea or, maybe, a “recollection” of where I would end up, but wasn’t positive. A small road sign informed me that the road would end in a few miles at the Canaveral National Seashore. HUH? Didn’t one get to the National Seashore through the Cape Canaveral area? Totally intrigued, I continued south and soon found myself at the attended entrance to the Seashore. The entrance fee of five dollars per car seemed reasonable and I asked the attendant if there was a map to be had. He handed me a printed map along with my receipt or “pass” which was good for an entire day. Pass and map in hand, I drove onto the property which, according to the map, was the “Northern District” of the Canaveral National Seashore. I pulled into one of the parking areas which promised beach access to take a closer look at the map and to take, at least, a peek at the beach and ocean. Well, I’ll be, I thought as I looked closer at the map reciting to myself, of course, the somewhat familiar place names: “Castle Windy”, “Eldora”, and “Turtle Mound”. Now, I can be a little slow on the uptake as they say from time to time and it took me a couple of minutes to realize that I had been here before. That time was almost 20 years ago when I was a graduate student at UCF. My herpetology class came here to look for salt marsh snakes and we were based in a house that the university owned on this property. A very adult and educated, “freakin’ cool”, went through my head as these memories and realizations came together. It was getting a little late, but I wanted to do two things before I headed home: walk the beach and see if the “UCF house” was still here. Crossing the dune on the elevated crossover, I stopped to look north and south along the beach. There were, maybe, five other souls as far as my eyes could see in both directions. I am not a crowd person and liked this beach quite a bit. I limited my time and distance walked knowing at this point that I would be back and probably soon. Noting the marked sea turtle nests at points along the beach, I hoped that there were… “enough”. Back to the car and, sure enough, there it was, the sign marking the UCF laboratory property. Wow, how cool! Hey Jodi, I’ve got a place for us to check out!